It’s hard to remember those days when you’re home wasn’t full of trip hazards and garish primary coloured toys disjoining the décor, but when you have little ones the mess monsters soon appear, and what was your beautifully decorated, organised home, can become a jungle of clutter that leaves you feeling stressed and ever so slightly anxious. Our home environment has a dramatic impact on our mood and overall wellbeing, making us feel overwhelmed and stressed as soon as we walk through the door is no way to be greeted when you get home after a long day at work. When you’re a parent it’s hard to let go of those neat freak tendencies, but you can reclaim your home without making sacrifices on the children’s fun. With just a few of these tips and tricks you can have your home back to the haven that it once was. Set aside a time that you can dedicate solely to cutting clutter from your home. By this, I don’t mean just a few minutes, but an entire day or afternoon. This may seem a big ask considering you’ve got little ones, but see if there’s a possibility of being child free so you can dedicate your time completely to the task at hand without being distracted. Allowing yourself time will ensure you follow the job through completely, and don’t get left with an even bigger mess than when you started. 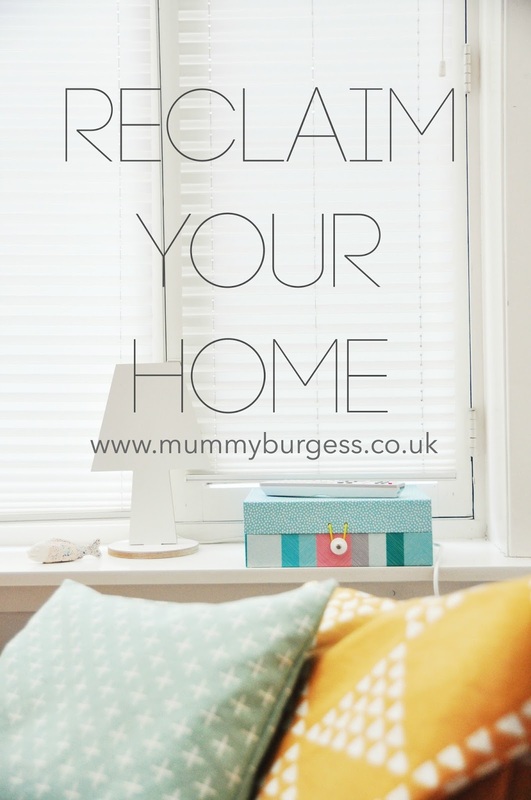 Take on the house one room at a time so you don’t end up procrastinating over tea and biscuits, and make the effort to clear out the room completely before putting it all back in one piece at a time. Making a conscience effort such as this will soon make you ask the questions, do you need it and do you really want it? If you’re really struggling for solid time, Leo Babauta at Zen Habits recommends 18 different de-cluttering tips that can help you conquer the mess in minimal time. Before you send them off on their play date it’s important you let them sort through their own million and one toys. After all, they don’t really need all of them, so explain to them that their toys are being donated to other children who don’t have any toys, and then you’ll save yourself the tears and tantrums later on when you’ve thrown something that they actually had a fondness for. It’s true that we’re a society completely wrapped up in consumerism. Despite not needing many of the things we own we’re lead to believe that our lives would be so much better if we bought more stuff! But the truth is living with less can sound very attractive to many people as it means less to clean, less to organise and a lot less stress. If you struggling greatly with letting, go of items then why not give away with meaning. Sometimes it can help us to let go of things if we know they’re going somewhere more useful. Whilst the charity shops will always need stuff, by choosing a specific charity to donate to can help to make the task more meaningful and a lot less brutal. For example donating any work wear to Smart Works may help a woman on a low income wage dress smartly for a jon interview and become financially independent. Such acts like this can make you feel much better about separating from your possessions. Each home has its own problem areas where mess seems to amount no matter what organisation system you put in or how many times you clear it out. But there are some basic rules that can help in these common clutter collecting area which may enable you to conquer it once and for all. The Wardrobe; Us ladies are probably the worst for this area than the men, as we keep things for ‘just-in-case’ moments, or for when we finally drop those extra few pounds. But let’s be honest, how long have these items really been buried in here for? If it doesn’t fit or make you feel fabulous it’s time to say goodbye. The Man Draw; We all have that draw that is home to the dead batteries, random cables, spare buttons, old birthday candles and screws that nobody can workout where they’ve come from. Although it’s a borrower’s treasure trove it’s doing your sanity no good, and when did you ever find anything useful in there? If you can’t bare to put it all in the bin, then Tupperware things up neatly and label them to make it feel at least part organised. The Computer; It may feel like an extension to our own bodies but we’re all guilty of filling up our computers with pictures and important documents that we never back-up. Not only does this run the risk of losing some of our most cherished photos, but it can be catastrophic if we loose documents relating to personal finance. Be brave and delete anything you no longer need, and archive anything you really want to keep on a hardrive or even on a USB stick such as these. That way everything can be as safe as possible, and you won’t be having a meltdown when technology decides to be against you. De-cluttering your home may feel like a mammoth task ahead, but once you’ve cleansed your home from clutter you will lighter and more free. Allowing your children to run around without crashing into mess and being able to sit back and relax in a more adult environment when it comes to bed time.